The first Apple store to open outside of the United States is a testament to the amount of influence that Apple has around the world. The metallic storefront of the massive 5-story Apple Store in Ginza, Tokyo barely seems to fit inside one of Japan’s most popular shopping centers, which is ridiculously huge in and of itself. It is one of Apple’s most profitable stores and was the home of the first ever “iPod Bar”. Located in what is known as the Sayegusa Honkan Building which was originally built in 1965, Apple completely renovated the space formerly occupied by Sumitomo Bank. The exterior of the building includes bead-blasted stainless steel paneling on the lower floors and glass walls for the higher floors. Floors 6, 7, and 8 of the building are occupied by other tenants. At the corner of the main street, Chuo-dori and Matsuya-dori is where customers will find the Apple Store. The 1 km stretch surrounding the store is called Chuo-dori (or Central Avenue), and includes three streets that run parallel to each other, connected by several other smaller streets running in a perpendicular fashion. Since the early 1900s this region has been a popular shopping district and is home to multiple high-end brand names, haute couture, the old Wako building and adjacent clock tower, and the Mitsubishi Dream Center. As the first Apple store to open internationally, the store in Ginza still remains one of the most iconic stores for the technology giant. While many of the features resemble those of the initial stores, such as the wooden tables, the Ginza Store includes a pair of elevators that constantly run between the ground and 4th floors. The Ginza Store is also one of the few that has the capability of serving diverse customer bases. When the store first opened Apple prided itself on the diverse qualifications and skills of the staff, something that has carried on to today. For customers who visit from other countries, the staff can collectively speak at least 10 different languages. Visitors to the Ginza Store, Tokyo not only experience a small piece of technological history with the first Apple Store to open outside of the United States, but they are also surrounded by the rich history of the Chuo-dori area. Included in that history is the Hakuhinkan Toy Park which dates back to 1899 and has eight massive floors, each one dedicated to every toy imaginable. In addition to this dream destination of children, there are also many high-profile shopping centers within the surrounding blocks, as well as museums, restaurants, and theatres. Ginza is usually very busy with both foot and motorized traffic, however getting around the area is fairly easy using the subway. Connections are available from the airport and there are many stations throughout the neighborhood. The Ginza Subway station G09 is only about a one minute walk from the store, or visitors can use Y19, the Ginza-Itchome subway. Most tourists forgo driving in this area as the streets are crowded and the public transportation is easy to use and quite affordable. 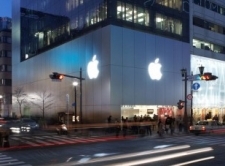 In fact, visitors who go to the Chuo-dori area on Sundays, where the Apple Store is located, will have to walk there anyway – the streets are only open to pedestrians on this day of the week.